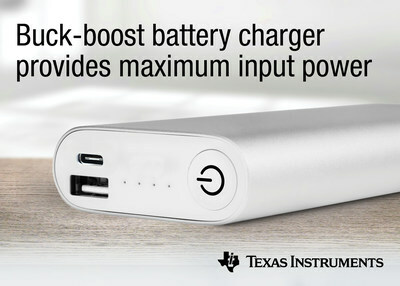 DALLAS, July 18, 2017 /PRNewswire/ -- Texas Instruments (TI) (NASDAQ: TXN) today introduced a pair of highly flexible, single-chip buck-boost battery charge controllers for one- to four-cell (1S to 4S) designs. The bq25703A and bq25700A synchronous charge controllers support efficient charging through USB Type-C and other USB ports in end equipment ranging from notebooks and tablets to power banks, drones and smart home applications. To learn more about the bq25703A and bq25700A, see www.ti.com/bq25703A-pr and www.ti.com/bq25700A-pr. Supporting both I2C and SMBus interfaces, the bq25703Aand bq25700A feature a new advanced battery algorithm enabling full power output by adding intelligence to battery charging through maximum power point tracking technology. The unique algorithm, referred to as input current optimization (ICO), automatically detects the full capacity of input power to optimize current, while maintaining consistent system and charging current to ensure the utilization of maximum input power. Input source flexibility: The device’s USB Power Delivery compatibility offers an input voltage range from 3.5 V to 24 V, which designers can use in multiple ports including USB 2.0, USB 3.0 and the newest standard, USB Type-C. Wide USB On-the-Go (OTG) output compatibility: The new charge controllers support input-ready devices from 5 V to 20 V and adjustable output for USB OTG with programmable current regulation. Compact configurations: TI’s new battery-charging algorithm and intelligent detection features enable the battery charge controllers to support wide input and output voltage ranges and more compact adaptor designs. Seamless transition between different modes : The devices support 1S to 4S batteries and an efficient transition between buck and boost operation without any dead zone. The bq25703A and bq25700A expand TI’s portfolio of industry-leading battery-charger solutions, offering switch-mode fast chargers and linear chargers for a broad variety of applications and power levels. Learn more about TI’s battery charging solutions for accurate, dependable and faster, cooler charging and how TI’s USB Type-C ecosystem provides protected power delivery for low power applications. Designers can use the bq25700A evaluation module (EVM) to easily evaluate device features and performance and speed time to market. The bq25703A EVM and the bq25700A EVM are available from the TI store and authorized distributors for US$149.00. Designers can use the WEBENCH® Battery Charger Designer to calculate the efficiency of the battery charge controller. The bq25703A and bq25700A charge controllers are now available through the TI store and authorized distributors. Offered in a 4-mm-by-4-mm, 32-pin quad flat no-lead (QFN) package, the controllers are priced at US$2.20 in 1,000-unit quantities. Read the blog post, "How a buck boost battery charger can transform the way you charge your devices." Visit the TI E2E™ Community Battery Management forum to search for solutions, get help, share knowledge, and solve problems with fellow engineers and TI experts. TI E2ETM is a trademark of Texas Instruments. All other trademarks and registered trademarks belong to their respective owners.